Four Seriously Injured in Summit Blvd. Accident In West Palm Beach | Schuler, Halvorson, Weisser, Zoeller & Overbeck P.A. Four people, including a pregnant woman, were transported to Delray Medical Center following a three-vehicle collision at the intersection of Summit Boulevard and Davis Road in West Palm Beach. Reports indicated that a man was driving his Honda Accord along the westbound lanes of Summit Blvd. when he attempted to make a turn onto southbound Davis Rd. Upon doing so, his car collided with the front of the expectant mother’s car and then spun out of control, consequently crashing into another vehicle. The other vehicle crashed into a street pole on impact. This crash in West Palm Beach caused four people to be injured. FHP Sgt. K.A. Hardley told reporters that both drivers had a green light. This was at the time of the accident an eyewitness. What caused the wreck was that the Honda driver took too much time making the turn. This was from Summit Blvd. onto Davis Rd. According to information provided by the Palm Beach Post, Summit Blvd. is closed at this time. This was as a result of the crash. Rescue crews are working to clear the debris. Investigations are ongoing. 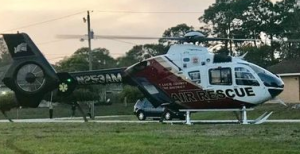 West Palm Beach personal injury attorney Jason Weisser of Schuler, Halvorson, Weisser, Zoeller and Overbeck responded to this unfortunate crash: “This is serious accident with four people that were reported injured in West Palm Beach. It does appear that the injuries were very serious to at least two of the victims. If the reports prove to be correct, it was indicated that the driver of the Honda Accord caused the accident. He possibly liable for the crash. We hope that it will be quickly discovered. Please be careful and obey the speed limits and traffic lights whenever you are driving a motorcycle, car, SUV or truck. This is especially true when there are children in the area. We hope that all parties involved consult with an experienced trial lawyer. If you have been injured in an accident, call my office for a free consultation to find out what are your rights”.